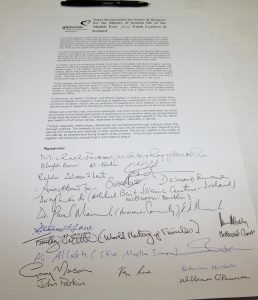 The signatories of the Glencree Declaration on the Dignity of Human Life in the Holy Land. Photo: Lynn Glanville. The Anglican Archbishop of Jerusalem has warned that many Christians in the Middle East “feel abandoned by God, and abandoned by their neighbour”. On a recent visit to Ireland, Archbishop Suheil Dawani highlighted how for many Christians, life in the Holy Land is very difficult. “We are a minority, perhaps only 2%. In Gaza there are only 1,000 Christians. Yet the Christians in the Holy Land have this steadfastness, this persistence not to give up, but to remain in the land where Christ lived,” he explained in his homily at Nun’s Cross Church last week. For some, the pressure is too much and tragically young Christians are leaving. The Christian community totals just 300,000 Christians in the State of Israel and the West Bank, Archbishop Dawani explained. “We are diminishing as many leave the land. Yet we have an important voice and an important message. It is a message that is not about place; but about people, about hearts, and about the hope and love that the message of Jesus Christ brings,” he said. Archbishop Dawani and his chaplain, Canon David Longe, visited the Church of Ireland’s United Dioceses of Dublin & Glendalough from 1 to 7 December. Their visit was part of the Jerusalem Link partnership between the dioceses of Jerusalem and Dublin & Glendalough. The Anglican Diocese of Jerusalem encompasses Jordan, Palestine, Israel, Syria and Lebanon. The Glencree Declaration. Photo: Lynn Glanville. While he was in Ireland, seventeen representatives of the three Abrahamic Faiths (Judaism, Christianity and Islam) in Ireland signed a Joint Declaration for Peace and Respect for the Dignity of Human Life in the Holy Land and presented it to the Archbishop of Jerusalem. The faith leaders pleaded for an end to violence and loss of life in the Middle East and pledged to work together to promote peace and deepen understanding. The Joint Declaration was presented to Archbishop Dawani at the Glencree Centre for Peace and Reconciliation last Monday. In the declaration, the faith representatives said they shared grief and pain at the death and suffering currently taking place in the Middle East, impacting dreadfully upon civilian populations, and prayed for peace throughout the region. “It is both the aspiration and the right of all people to live in freedom and security without fear. People of all faiths are equally entitled to enjoy such things and yet each sees the other as denying that right to the other with a consequent spiral of violence. Our prayer and plea is for this spiral to be broken and safety and security to be restored to all with a new beginning established through a commitment to parity of esteem in both politics and society,” the declaration reads. The faith leaders were among about 60 people from religious, political and community backgrounds who gathered in Glencree for an event entitled ‘Milestones on a Journey of Hope’. It recognised the ongoing suffering which continues to affect many parts of the Middle East, and offered an opportunity to explore and reflect on some of the experiences of Ireland’s journey out of violence into the hope of a brighter future. Archbishop Suheil Dawani of Jerusalem with Archbishop Michael Jackson of Dublin & Glendalough and some of the people who attended the ‘Milestones on a Journey of Hope’ event in Glencree. Photo: Lynn Glanville. Among those who attended the ceremony in Glencree were representatives of the Armenian community in Ireland. The Dioceses of Dublin & Glendalough have a special bond with the community, which worships at the Church of Ireland’s Taney parish in Dundrum. Last month he welcomed the Anglican Archbishop of Birmingham to his Cathedral in Jerusalem, while the Church is exploring different aspects of dialogue and communion with the Greek Orthodox Church. “These are just a few examples of our ecumenism as played out in trust and in friendship. They are played out realising that we need to be united in Christ: we cannot afford division in a land that already has so much division. Our fellowship deepens through our respect for each other and our mutual goals,” he said.